How to watch Inglourious Basterds (2009) on Netflix Norway! Sorry, Inglourious Basterds is not available on Norwegian Netflix, but you can unlock it right now in Norway and start watching! With a few simple steps you can change your Netflix region to a country like Panama and start watching Panamanian Netflix, which includes Inglourious Basterds. We'll keep checking Netflix Norway for Inglourious Basterds, and this page will be updated with any changes. 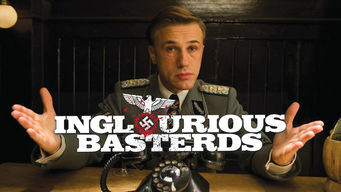 Inglourious Basterds is not available in Norway BUT it can be unlocked and viewed! A Jewish cinema owner in occupied Paris is forced to host a Nazi premiere, where a group of American soldiers called the Basterds plans a face-off. During World War II, a fierce band of Nazi hunters close in on the biggest prize of all. Oh, sweet revenge! There is a way to watch Inglourious Basterds in Norway, even though it isn't currently available on Netflix locally. What you need is a system that lets you change your Netflix country. With a few simple steps you can be watching Inglourious Basterds and thousands of other titles!